1. Login with your account number and PIN. 3. Your new 'ring to' or call forwarding number is now changed, in real-time. Some customers use this service not only as a call forwarding facility but as a means to make cheap international calls from their assigned local call forwarding number. For example, if you were a customer located in the U.S. and had subscribed to a Call My Global Number, you could login to your account via the Web and change the 'ring to' number to any number in the world that you want to call. 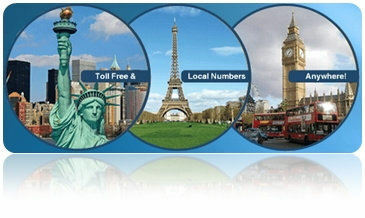 After you change the 'ring to' number, you can then dial your assigned local U.S. number and your international call would connect at low Call My Global Number rates. The change you made to the 'ring to' number takes place in 'real time'. 1. Download the free softphone app for your smarphone. What is a Ring To Number? The 'ring to' number is the phone number you want your calls forwarded to. It is also known as a call 'destination number'. For example if you want your calls forwarded to a phone number in India, that number in India would be your 'ring to' or destination number. You can instantly change your 'ring to' number online, 24 hours a day from any Internet connection.